Kim Kardashian and husband Kanye West might have an estimated joint net worth of $155million but the duo was spotted slumbering in their cramped and uncomfortable seats, a far cry from the usual champagne reception and VIP treatment they're accustomed to in first class. 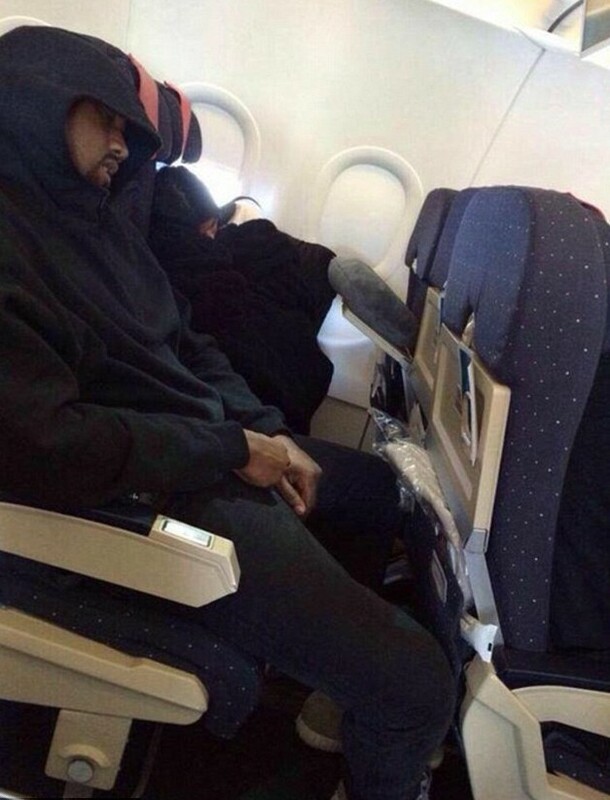 The superstars flew in economy to Armenia earlier this month..
A photo going viral on Twitter, showing the duo trying to catch a nap in amongst the other passengers in cattle class. Kim appears to have mastered the art of airplane sleeping and is seen curled up on her seat with her coat covering her like a blanket. Kanye was relegated to the aisle seat, slouching awkwardly with his hood pulled over his head to try and conceal his identity. This isn't the first time Kanye has been spotted slumming it with the masses. West was caught napping alongside his mother-in-law Kris Jenner as they caught the Eurostar from Paris after an action-packed Fashion Week schedule earlier this year. The rich and famous need to economise at times!